Current changes to the energy market, as well as an ambition to achieve decarbonation and highly energy efficient systems, will lead to a fundamental change in the way in which energy systems are designed and managed. In particular, the growth of renewable and renewed energy will introduce a level of design and management complexity with a greater need for efficient energy storage. 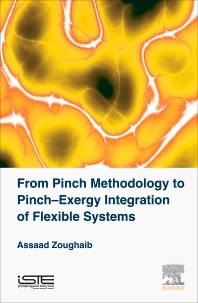 Beginning with the earliest methodologies (pinch), this book explores the methodology and tools necessary for the design of flexible energy efficient systems. In addition to studying the related literature, the author details original developments where exergy consumption is introduced as an objective function to minimize in mathematical programming models for both continuous and batch processes. Most of these developments were made in the Center for Energy Efficiency of Systems at Mines ParisTech and reported in PhD dissertations and published articles. The whole methodology is implemented in the open source CERES platform. Processes: From Pinch Analysis to Hybrid Exergy/Pinch Analysis. Integration Techniques: Energy Storage Optimal Design and Integration. 3. Exergy-based Methodology for Cycle Architecture and Working Fluid Selection: Application to Heat Pumps. Assaad Zoughaib is Professor at Mines ParisTech in France, and leader of the Thermodynamics of Systems research group. His research focuses on systemic methodologies for the energy efficiency of systems and the development of innovative high efficiency energy conversion systems.